Individuals who develop new or suddenly worsening symptoms consistent with nerve root or spinal cord impingement following a traumatic event are sometimes diagnosed with “disc-osteophyte complexes”. 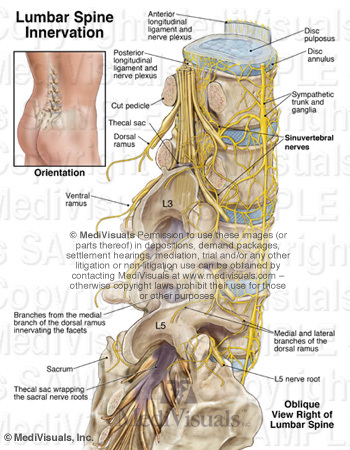 The term “disc-osteophyte complex” generally refers to abnormal extension of intervertebral disc material that accompanies immediately adjacent osteophyte formation at the vertebral body margin (see the below figure). 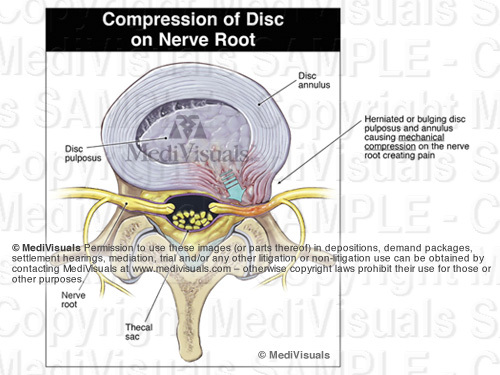 It is important to note (as shown in the illustrations) that the disc almost always extends further than the osteophytes into the neural foramen or spinal canal to irritate or impinge upon nerve roots or the spinal cord. 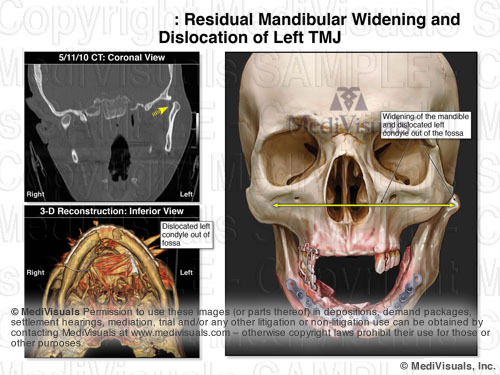 Occasionally, individuals who are evaluated shortly after a traumatic event are found to have disc-osteophyte complexes. 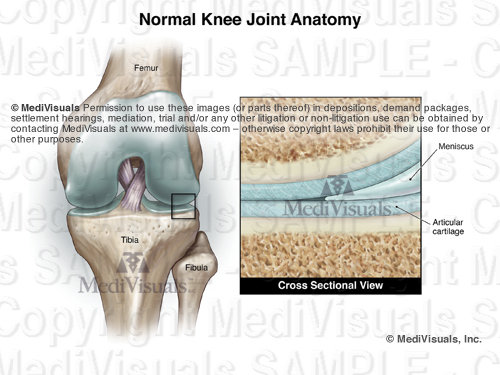 Because a minimum of several weeks is required for osteophytes to form as a result of a traumatic event, defendant insurance companies may argue that the presence of osteophytes so soon after the traumatic event in question may prove that the plaintiff’s injuries preexisted the traumatic event. 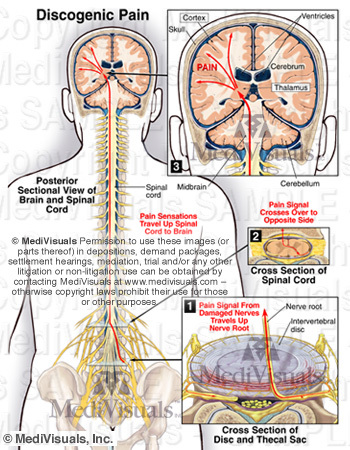 Since it is the disc pathology extending beyond the osteophytes that is the actual cause of the nerve root or spinal cord irritation and inflammation, the defense’s arguments are not valid. 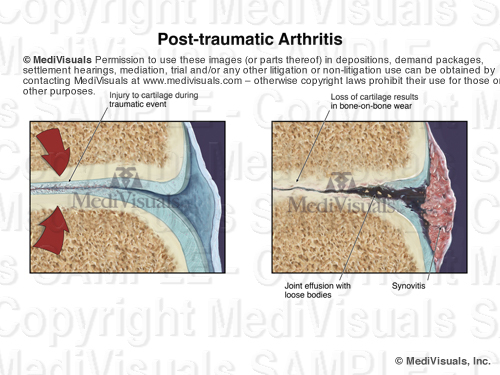 As shown in the illustrations below, the sequence of events that typically takes place in these cases is that the plaintiff had minimally symptomatic or asymptomatic disc osteophytes prior to the traumatic event in question. 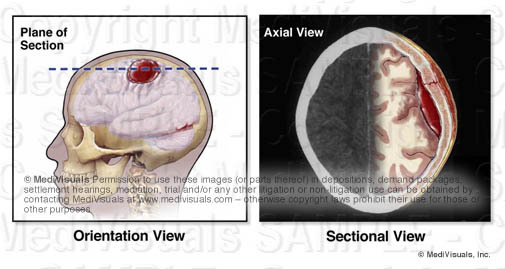 During the traumatic event, the disc sustains trauma that results in worsening of the disc pathology while the osteophyte portion of the osteophyte/disc complex remains essentially unchanged. This worsening of the disc pathology in turn results in new or increased irritation or impingement of the neural elements. 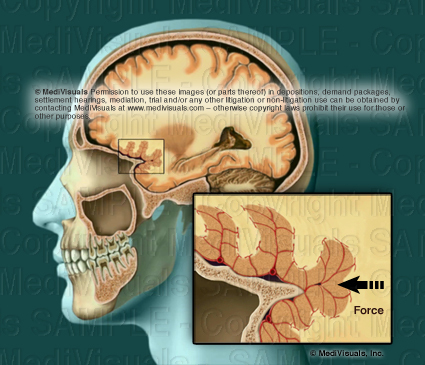 The surgical trauma that a plaintiff has to undergo after the initial bodily injuries following a traumatic event are always major points of emphasis when arguing damages in a personal injury case. 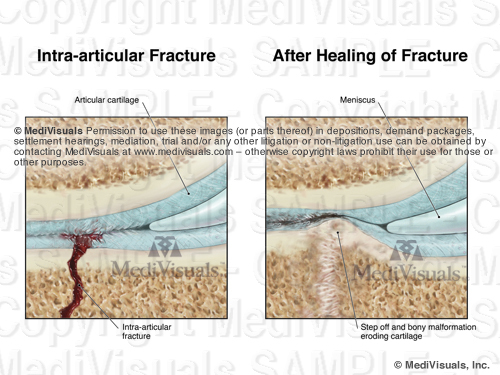 This is certainly the situation with cases that involve broken bones that require invasive surgical procedures to realign broken bone fragments ("reduce") and secure ("fixate") the bones with hardware to keep them properly aligned during healing. 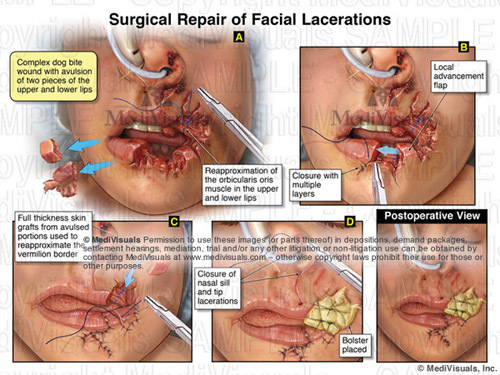 Too often, however, the emphasis is solely on the effects on the bones from these "Open Reduction and Internal Fixation" (ORIF) procedures, and very little emphasis is placed on the surgical disruption of the soft tissues that takes place during these procedures. 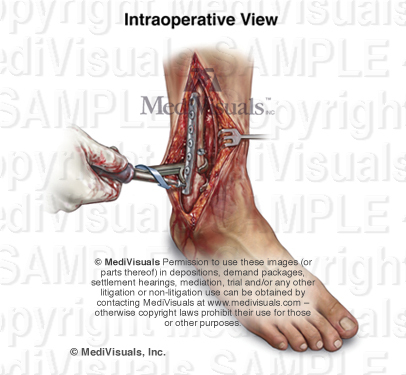 In a case involving ORIF of a distal fibula (a.k.a. 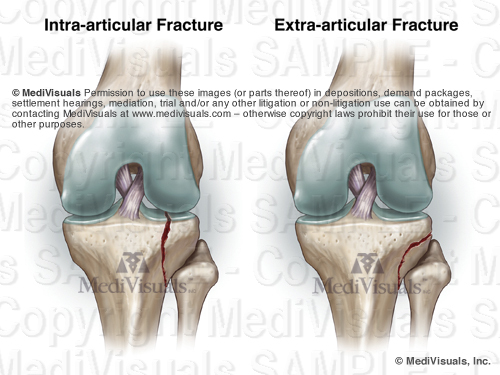 lateral malleolus) fracture, in order to emphasize the surgical trauma endured by a plaintiff, an attorney may have a visual prepared of a postoperative X-ray. 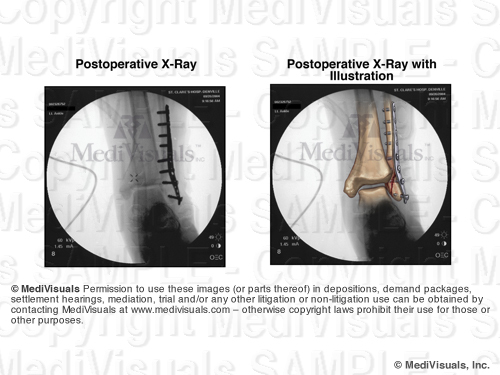 The visual may consist of only a postoperative X-ray or a print of the X-ray with a corresponding illustration (see the below figure). 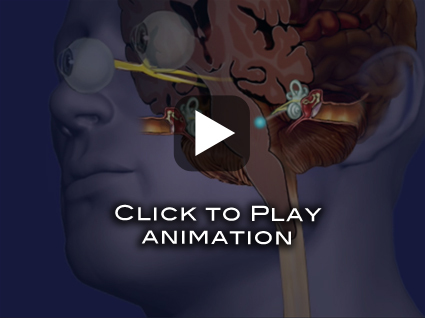 Illustrations or animations that at least touch on the soft tissue disruption allow testifying physicians the opportunity to explain the many tissues traumatized during the procedure and allow insurance adjustors, mediators, and jurors an opportunity to take these additional injuries into consideration when determining the severity of a plaintiff's entire injuries. 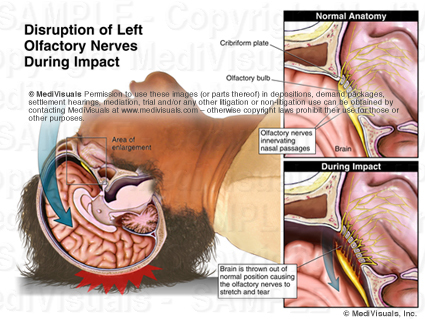 Many attorneys considering realistic illustrations such as the one above, express a concern that judges may not allow the images to be used because they are too "graphic" or "inflammatory". 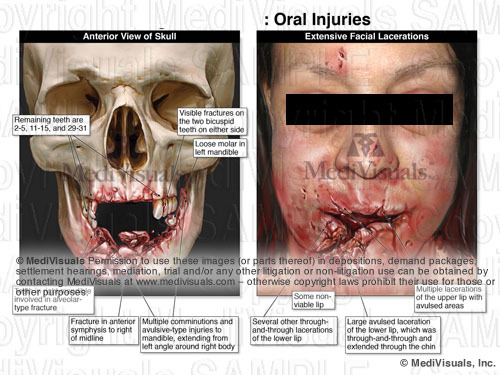 Certainly, counsel should make themselves aware and consider the preferences of certain jurisdictions and specific judges before determining whether an illustration should be developed that realistically depicts injuries or whether diagrammatic (cartoon-like) illustrations should be developed instead. 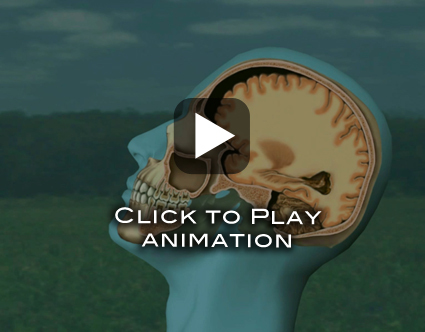 There are a number of very good arguments to support the use of "realistic" illustrations over "cartoons".  Those arguments as well as other discussions regarding illustration styles will be addressed in future blogs. 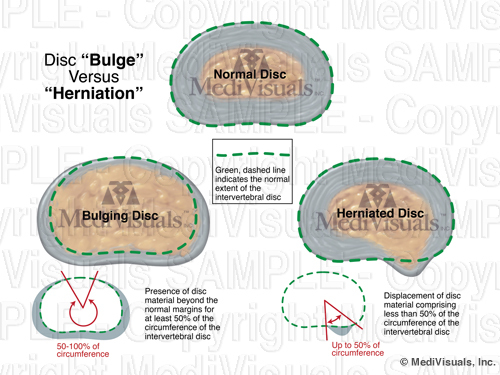 This blog is a follow-up referencing language and labels used by health professionals to describe various types of intervertebral disc pathology as defined by a 1995 joint undertaking by representatives from the North American Spine Society, American Society of Spine Radiology and American Society of Neuroradiology. 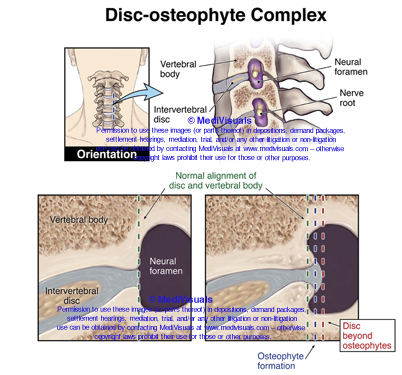 As a result of their efforts, a more uniform and widely accepted use of nomenclature to define intervertebral disc pathology was developed and published in "Nomenclature and Classification of Lumbar Disc Pathology". 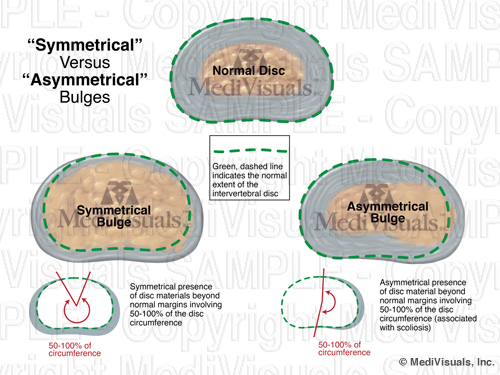 A previous blog dealt with "Symmetrical" and "Asymmetrical" disc "bulge" and "Broad-based" v. "Focal" Herniations. 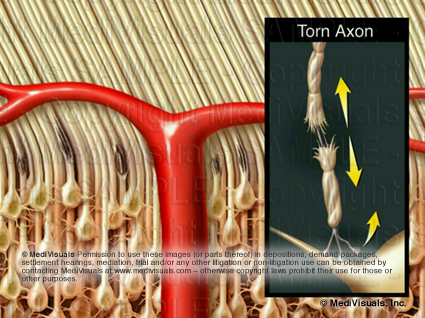 The first disc pathology term discussed in this blog is "Annular Tear". 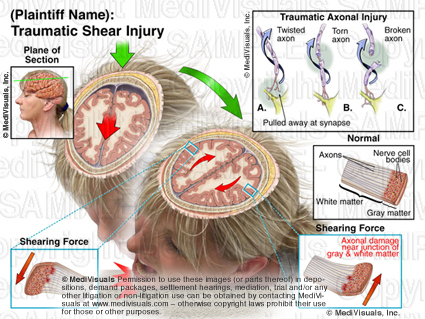 This is essentially synonymous with "Annular Fissure," with perhaps "Fissure" being preferable over "Tear" because "Tear" may imply that the pathology was the result of some sort of traumatic event, and this specific pathology can occur without necessarily being the result of trauma. 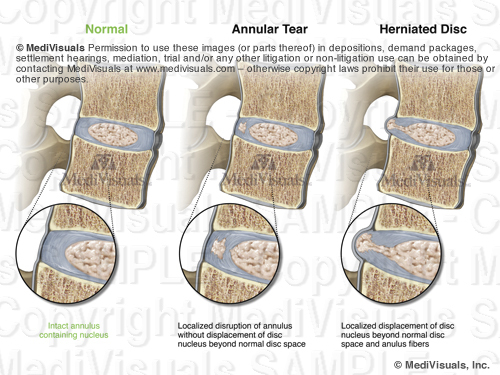 Annular Tears/Fissures, as seen in the below figure, can occur without fitting the definition of a "Herniation" (disc material extruding beyond its normal boundaries). 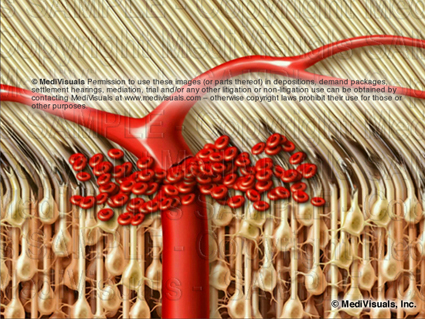 As seen in the below illustrations, the fibers of the annulus can be torn with nucleus protruding into the annulus but without the annulus or nucleus extending beyond the bordering vertebral bodies. 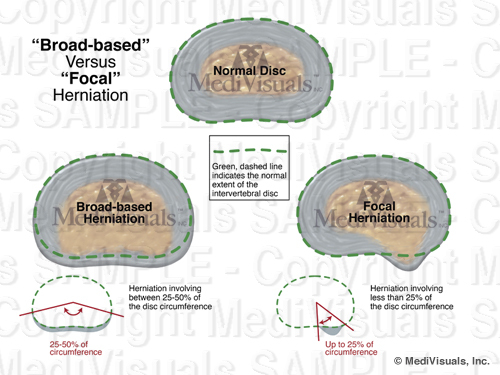 By contrast, when "Anular Tears/Fissures" result in disc material extending beyond its normal boundaries, the disc pathology is typically referred to simply as a "Herniation" without a reference to the presence of an Annular Tear/Fissure". 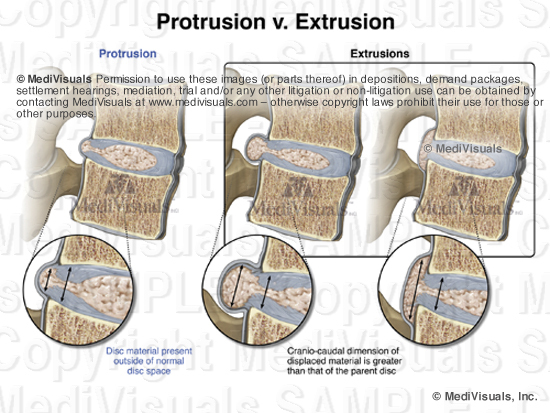 Another blog will be coming soon regarding disc "Protrusions" and "Extrusions".